THE BEATLES: MEET THE BEATLES: 1964: MONO VERSION: I haven’t got a good dose of The Beatles in the past few weeks- so I thought I’d start to go through the Capitol American versions of the albums. I prefer the UK releases but its nice to listen to the ones I grew up on now and then. THE BEATLES: THE BEATLES SECOND ALBUM- 1064: MONO VERSION: It seems strange listening to the American versions after mostly 30 years of listening to the UK versions. I keep expecting certain songs to follow other songs.. nice to mix it up now and then. These Beatles may have made it if they had kept together a little longer. Apart from the song order, can you tell the difference in the mixes? I saw “The Capitol Albums Vol 1” cheap on eBay not realising the UK masters had been changed then read up about how many, including the band, were not happy. 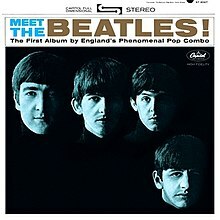 ‘Meet the Beatles’ is the very first album I ever purchased, at the tender age of 9.